I am so proud to host this second premiere of films by emerging women filmmakers who completed the CHA/DePaul Filmmaking Program. On Sunday, April 28th, you are invited to join us in Chicago at the 300-seat Claudia Cassidy Theatre, at the Chicago Cultural Center, on the 2nd Floor North, 78 East Washington Street. 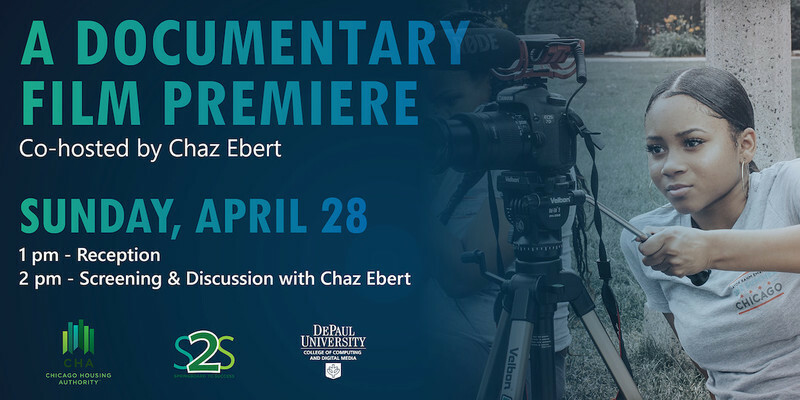 Four short documentary films written, directed and produced by Chicago Housing Authority (CHA) youth filmmakers in collaboration with the DePaul School of Cinematic Arts will make their world premiere at this special screening. An hour-long reception in the beautiful glass-domed GAR Rotunda will begin at 1pm, followed by the program at 2pm featuring the following shorts: "Birthday," "South Side Pride," "Without Dying" and "Phenomenally Me." I am honored to be co-hosting this event, and I encourage all local film lovers to join us so that you can see how they view the world. You will emerge changed. The event is free, but you must sign up for a ticket for entrance. To RSVP for this free screening, visit its official Eventbrite page. Click here to read my article on the CHA Documentary Program.